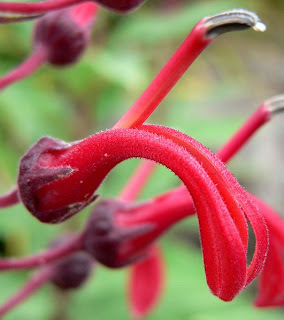 I just can't say enough good things about Lobelia tupa (aka Tobacco del Diablo) or as I call it "Hummingbird Crack." Here in Portland, it emerges in spring and can be 7-8 feet tall by the end of summer. The plant itself stays only a few feet tall, but the flower spikes get quite tall over time. It does have a nice coarse texture which is a nice contrast to other plants too and it enjoys its home in hot full sun. In fall, I just let it die back and then cover the crown with bark for the winter. It does leave a big hole in the flowerbed when it is sleeping though as it takes up a lot of room when growing. The Hummers are very territorial in my yard and fight over this plant constantly. There is one that has a lookout in a neighboring Camellia and will fight off any other Hummer that comes near it. I'm 6'2", the blooms get very tall by September. I'm SO jealous! I keep trying to find a spot big enough for these...and even then, I fear I just wouldn't have enough sun to keep it from flopping. Sigh...I'll just have to be content enjoying yours. I've had to remove about a 3rd of the stems this year as it was getting way too huge. I tried to divide it but was unsuccessful, all the stems I tried to remove were rootless. So I just resorted to hacking off the wild ones. I am always looking for suggestions on how to diversify the plantings to support my two hummingbirds and this appears to be a great option. Thank you.